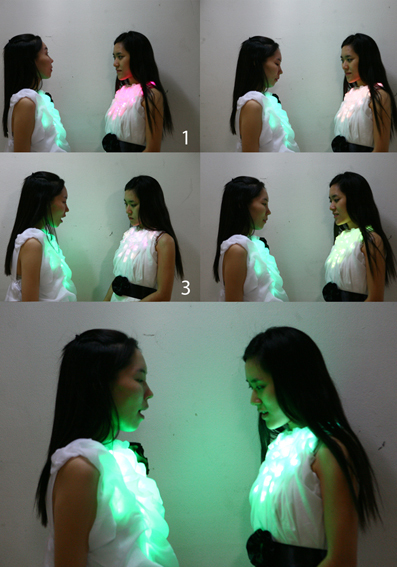 “Conversation” is a set of dresses that communicates with each other visually (in this case, in different color of LEDs and blinks.) The artist tried to visualize the process of conversation and how the listener can be influenced by the talker. If the wearers are within a certain distance from each other (friendly space,) they can influence each other by talking to each other. The dress of the listening wearer’s color changed to the color of the talking wearer in this case. This represents inner changes and spiritual communion achieved by their conversation and is being visualized . The artists has earned BFA and MFA from Digital Media Design dept of Hongik University, Jochiwon Campus, College of Design and Media.